To be or not to be – a wine blogger ! I am a wine blogger since almost two years and I have seen and visited many blogs on wine and food, wine tastings, viticulture and wine-making. Some of these blogs I frequent often, others, only from time to time. 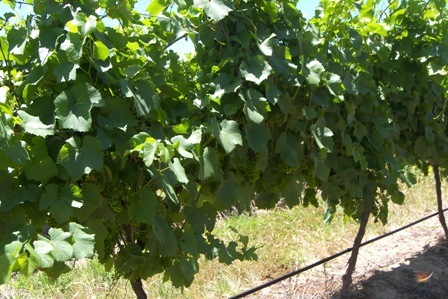 It is always informative and I learned many things about the wine industry and how people think and feel about wine. Last night was another one of those nights when I could not sleep and so I started to surf the internet’s wine websites and blogs. I was reminded what a terrific world is out there. Goodness me, how interesting this is. I could not stop looking around. Amazing what I found. The wine and food bloggers come in many types, colours, shapes, characters, personalities, professions, etc. work in teams and thereby share the burden to produce content and attempt to avoid boredom. Some do it for money, most do it to have fun. It goes without saying that some, while doing it for money, have fun as well. The reality of the modern blogger. Let me share with you some of my findings and conclusions. First, I felt pretty small and amateurish, technically as well as subject matter wise. There are so many knowledgeable people out there, amazing. My own blog which I tend with loving care since January 2007 is a rather simple affair. Out there in cyberspace there are sites with podcasts, with videos, with music, with slide shows, presentations, breathtaking links and so on. Exciting stuff. I have only stories and some pictures. Second, the world of wine bloggers is pretty dynamic. Moreover, they seems to lead interesting lives. Third, wine bloggers network quite a bit. Last year I followed the German wine bloggers workshop at an important wine expo (I forgot which one). At the end of August the European Wine Blogger Conference (http://ewbc2008.wineblogger.info) was held in Spain (in Logrono!). The American blogger community will follow suit in October in Sonoma County in California (http://winebloggersconference.org). The participants list is very impressive. What a large community there is. 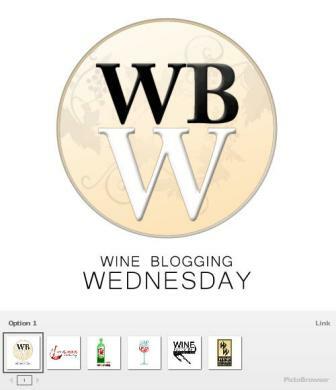 As with music and films wine bloggers are rated in “top” …. something. For instance the top 100 and other lists of top bloggers, either rated by links and/or traffic or after voting by users. I found such a list from June this year. And can you imagine the top 100 is lead by a German wine blogger (Dr. Achim Becker of Wineterminator). The second blogger gets almost only a third of the top one’s votes. Wine Library TV (Gary Vaynerchuk) ranks only in 5th position. No. 6 is another German (Mario Scheuermann and his Planet Bordeaux) who ranks in 10th position with another blog (drink tank). I suggest you explore this cyberworld yourself. 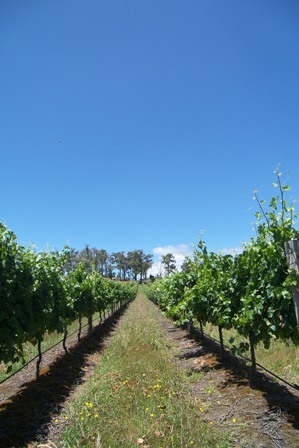 And do not forget to visit wineries and vineyards from time to time. the real stuff. 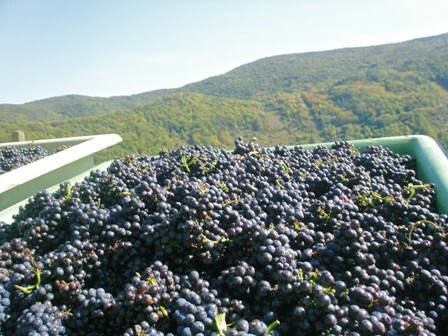 Pinot Noir grapes at the Ahr. It’s vintage time in my native Germany. Reports I am reading about the harvest conditions seem to indicate that everything is going well. Also my German wine blogger colleagues seem to be content. Down under in Victoria, we have springtime. Spring is usually Victoria’s wettest season. However, weather reports indicate that this September will be one with the lowest precipitation in history of Victoria. Melbourne recorded only 16 mm of rain in September, the lowest since recording began in 1855. The long-term average is about 59 mm. Also average day temperature was well above the long-term average (19 instaed of 17 degrees celsius) which make September 2008 the warmest September since 2001. The same trend could be observed regarding night temperatures. 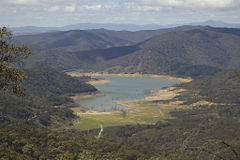 Reservoirs around the state are at a record low as well. 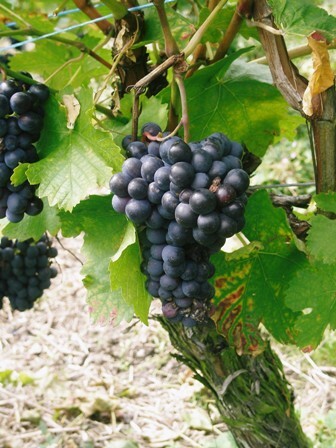 That’s no good news for vintners and grape growers. 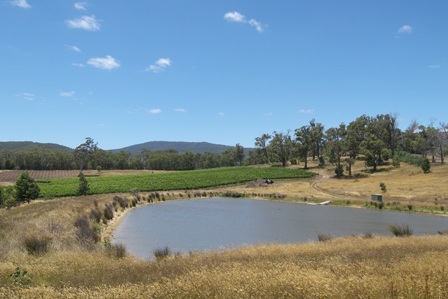 I wonder how full our two dams at Two Hills Vineyard are. So far we had always had sufficient water to bridge the 4-6 weeks of high summer. Last year we had hoped that the draught would be finally broken. That seems not to be the case. But as always, we hope for a good harvest. 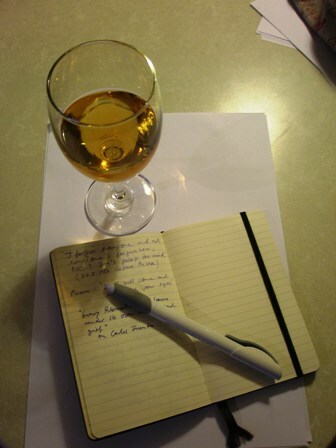 No, I am not writing about wine this time. 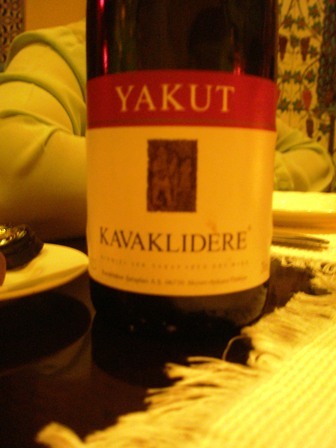 But you might ask ‘What is the pearl of the orient’ if not a wine? Well, read this. 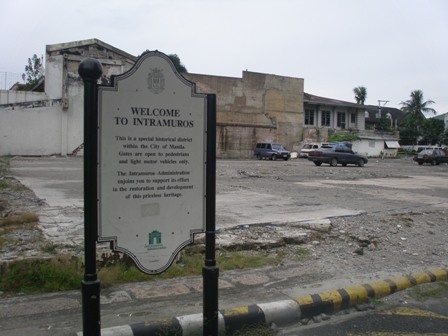 “Intramuros” (freely translated as ‘within the walls’) is the title of the walk through old Manila City which I joined last Sunday. It should turn out to be the most amazing city tour I ever participated in in my life. 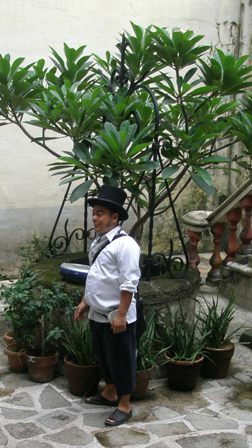 Carlos Celdran, the man who guided us through old Manila (www.celdrantours.blogspot.com), is the most interesting tour guide I have met. Before writing this I visited his blog and recommend you to logging on to it. 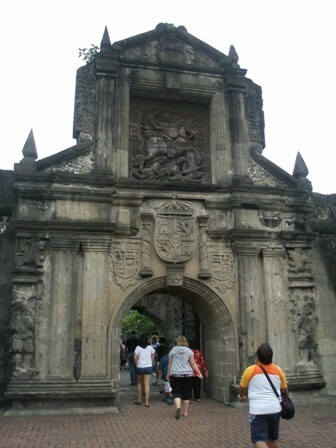 There are many reviews about the Intramuros walk as well. So google the man it will reward you with more information than I can give. Walk this way please. 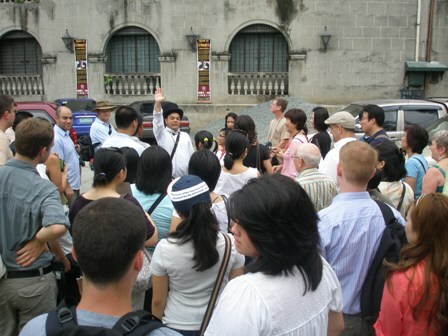 About 60 people had showed up at the entrance of Fort Santiago to learn more about the history of “The pearl of the Orient” as Manila was called. The normal number is around 25 to 30 people. The showing of that Sunday was just overwhelming. Half of the eager tourists wanting to learn about the history of Manila were Filipinos or better Filipinas, because most of them were female. Carlos arrived in a black Spanish hat, had a microphone around his neck and a folder in his hands. He invited all the Filipinos to help him with the tour and subsequently involved them in all kinds of questions and answer games. But starting we did with a joint singing of the Philippine national anthem followed by an explanation of the meaning of various words in the local language (Tagalog). “Nila” from Ma-nila for instance standing for a kind of flowering mangrove which was to be found in the area. Above you see the entry with the wooden relief of Fort Santiago. The Spanish had taken the city from their Muslim rulers by force which is shown somehow on the relief (I forgot who the slayer is). At that time the city was made entirely of bamboo because no other building material was available. I cannot repeat here all what was explained to us. Anyway the history of Manila can be read about on the internet and in books. But while following Carlos on our walk, we learned about history, religion, culture, people, the Spanish and the Americans and others who left their traces in this place. We got a glimpse of Jose Rizal, the national hero of the Philippines, generals and politicians crucial for Manila and the Philippines. Walk this way please. But if you are around, join the tour of Carlos. That’s better than reading and you might have a chance to remember much more because of the vivid, energetic and illustrative style of Carlos. He uses songs, photos, mimic, some acting, all in all great showmanship. And its educational as well; entertaining too I should add. Here is the group in front of the museum next to St. Augustin church, the only one remaining of the original seven churches in the perimeter of Intramuros. The main entrance of the church is guarded by four Chinese lions. We lit candles in the church which entitled us (novices to churches in the Philippines) to three wishes. Walk this way please. 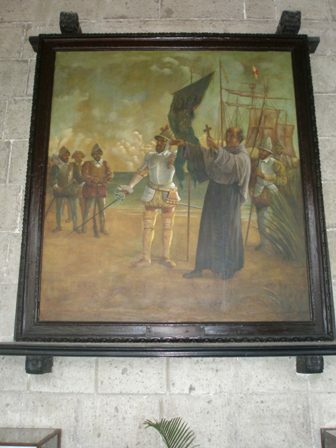 The painting in the museum depicted the landing of the Spanish among other scenes from colonial times. 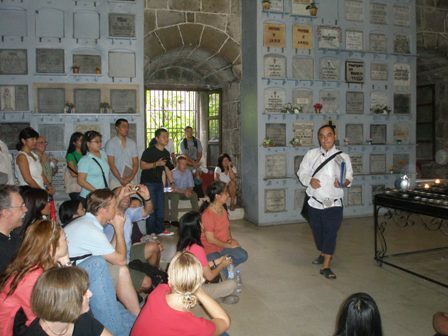 In the crypt, we learned about the Japanese occupation, the slaughtering of Manila citizens and the bombing by the Americans that finally destroyed the historic centre. Carlos is among others promoting the better maintenance, preservation and even the reconstruction of Intramuros as it is part of the core of Philippine civilization. 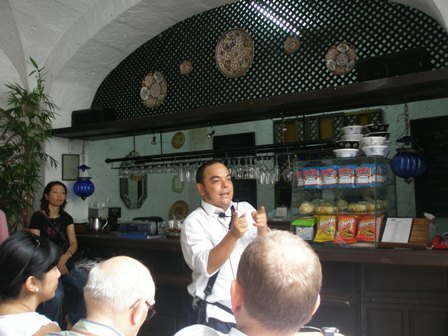 The end of the three hour tour consisted of an explanation of Filipino cuisine. It inspired me so much that I should buy a Philippine cooking book a couple of days later. At the end of the “show”, and I mean the very entertaining city walk, Carlos made us all taste “halo-halo” (meaning mix-mix), the traditional iced dessert Filipinos are so fond of. He finally recommended a traditional restaurant to us and sold us some of his maps. The good-byes were warm, we all left mesmerized. I guess nobody was dissatisfied and nobody minded the price (850 Pesos, half-price for students). I must conclude that Carlos changed my perception of Manila and the Philippines quite a bit. I have less prejudices now and I am very appreciative of the island nation. 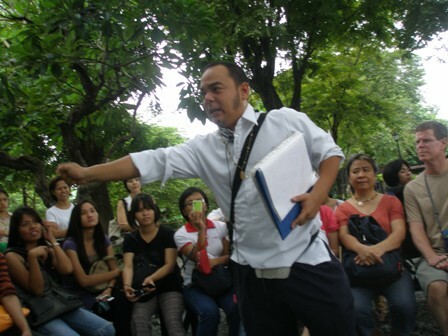 I will visit again and I might go on to another walk with Carlos Celdran. The Blog and Tour Schedule of Carlos Celdran. A man who is trying to change the way you look at Manila – one step at a time. The wine industry receives confusing signals these days. 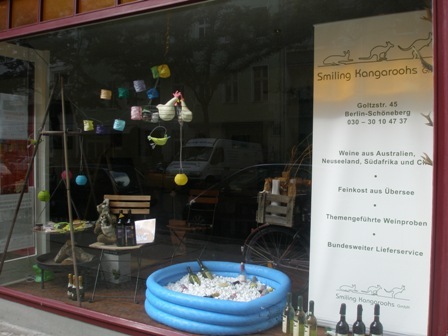 In Germany and the EU the ban of advertisement for alcohol and alcoholic drinks is in the making. In some media the devastating effects of such regulations are already being discussed. There were also voices in favour of a ban supporting the current regulatory trend which attempts to further restrict our basic human freedoms and violating our rights. After the bad news, the good one: In recent news the advent of wine distribution through Amazon was hinted at. The start of wine marketing through such a potent internet channel could not be a more distant twin of the current ascetic (fun and joy hating) trend described above, first hitting smokers and now (maybe) the wine lovers. However, history suggests that human freedoms can be curtailed for a short while only. Ultimately we will break free from such patronizing behaviour of the state, because we are all voters and tax payers and as we say in German, ‘where there is a will, there is a way’ (Wo ein Wille ist, da ist ein Weg). I bring you good news from Berlin. 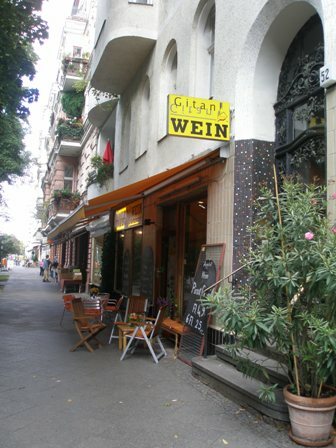 The other day I strolled through the streets near Nollendorf Platz, and discovered to my great surprise a rather large number of wine shops in a rather small area. I randomly took pictures which I present to you below. 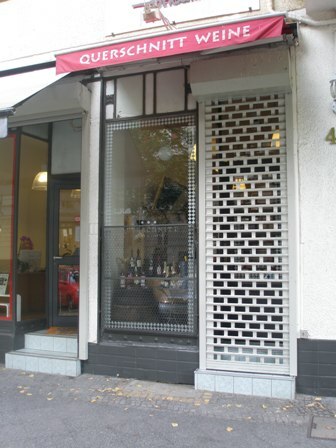 Most of the wine shops are specialised, usually carrying wines from one or more regions or a selection of countries. 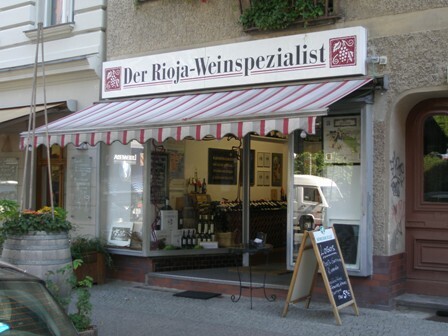 Above a Rioja specialist, below a shop selling mainly French wines. 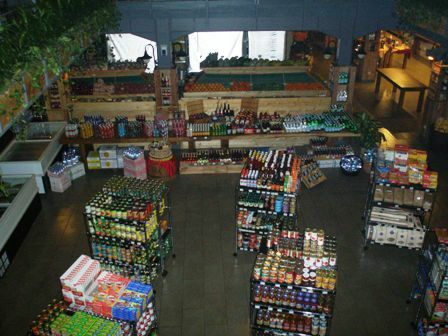 Some shops try to offer a wider selection, despite being “small”. 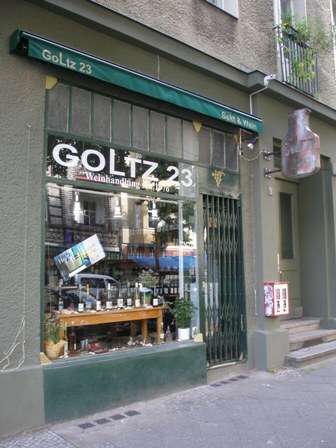 Others, as above in Goltz street, offer broad choices. 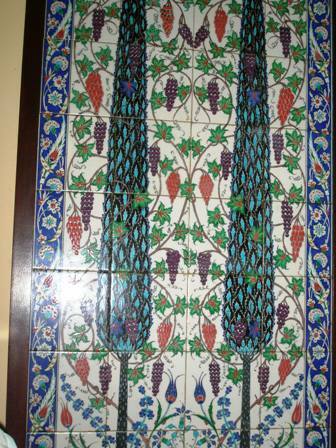 I even found an Australian wine shop with remarkable decoration. 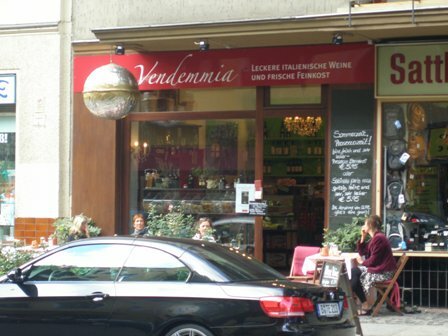 Others offer Italian wines combined with other shopping and relaxation capabilities. ‘European and overseas wines’, is what the writing says; wow that’s amobitious. 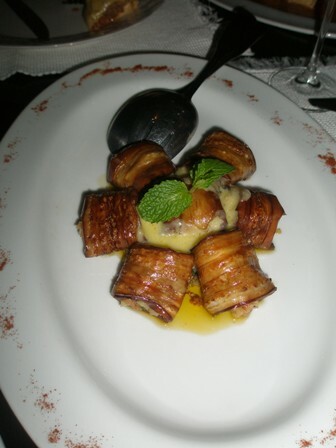 But there are not only very specialised wine shops to be found but also very specialised restaurants. 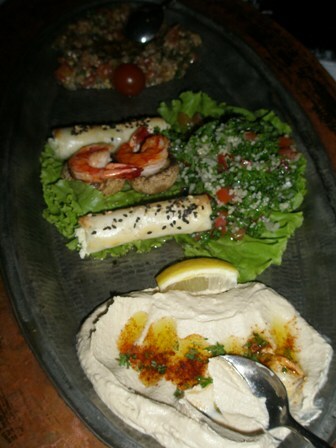 I do not refer to the Habibi Falafel, the Iranian, the Italian, the Turkish, Indian and Spanish restaurants. I found two eating places which were quite special. Many years ago I have dined in a Tibetan restaurant once in Kathmandu. 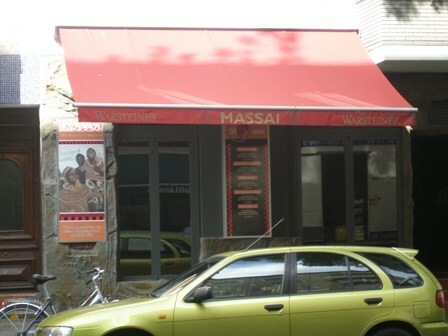 Never before I have seen a Massai restaurant, even when I travelled through Tanzania and Kenia, there were no such eatery in sight. Berlin got it all. 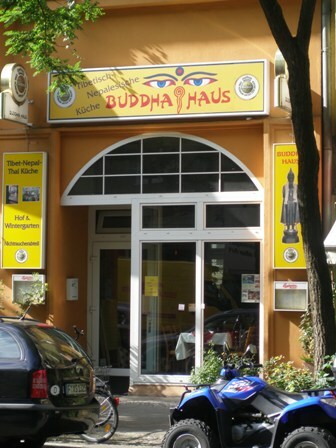 What would you eat in a Buddha House? 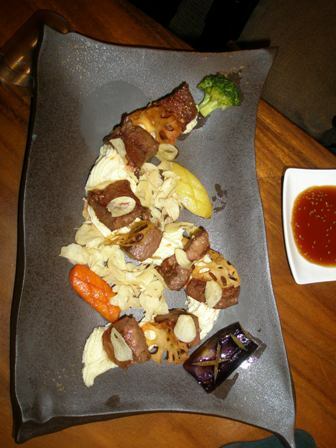 Answer: Tibetan, Napali and Thai cuisine. Bon appetit. 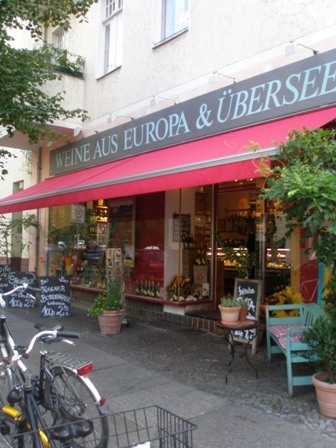 My tip: visit Berlin, it is such a fabulous place to explore and to discover. It was another farewell but one of those were time seems to have stopped. We enjoyed the moment, the pleasure of being together for a memorable meal and we did not think much about parting or not living in the same city again. Any future starts in the present moment, and we were sure we would have lots of it. We were not doubting that we would meet again, as friends do. Well, were did we go? And who is “we” in the first place? 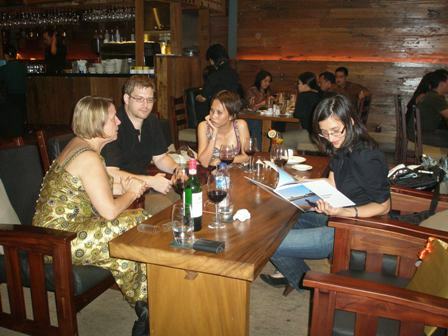 To answer the first question, we met at the Gourmet Garage in Kemang, Jakarta, a very fashionable place. It was also easy to reach for all of us. The inside of the Gourmet Garage in Jakarta with various shops on the ground floor and the restaurants upstairs. The answer to the second question is, there were the five of us: Flo (Florian) and Nelly, Jasmin, Margit and me. The three had invited us to spend our last Friday night in Jakarta among friends. They talked us into ordering the four-course Japanese meal. 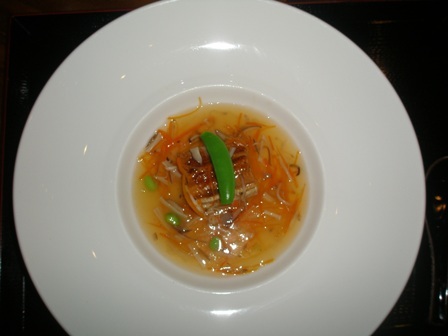 Depending on the day, the chef changes the composition of the dishes of the four courses. Surprise, surprise but since we like adventures, we were eager to wait for things to come. 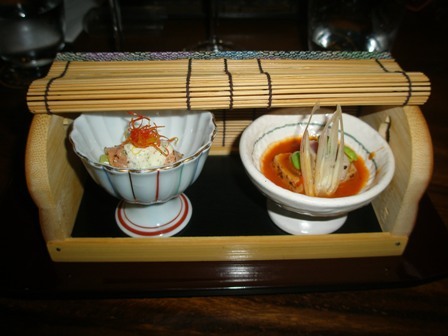 Flo and Nelly ordered other dishes from the Japanese menu. There are two more menus to choose from at Gourmet Garage, a Western menu and an Indonesian menu. Flo started with an oyster. 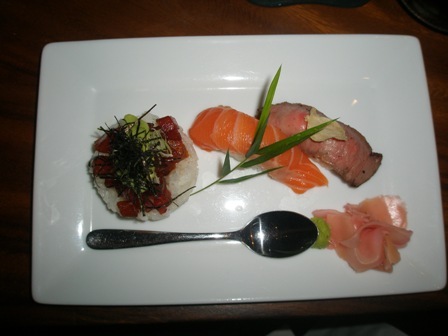 The starters for the four-course menu were beautifully decorated. 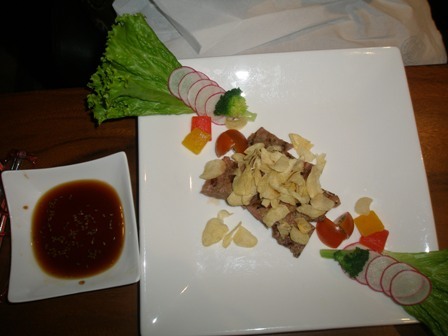 So were other dishes from the menu. This soup was just delicious. 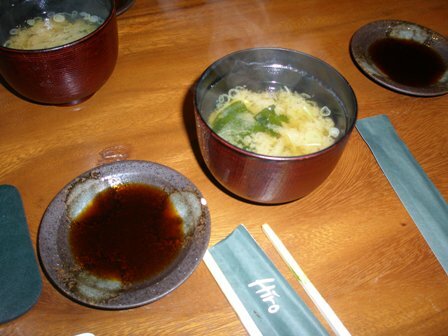 The miso soup came with the four-course meal. 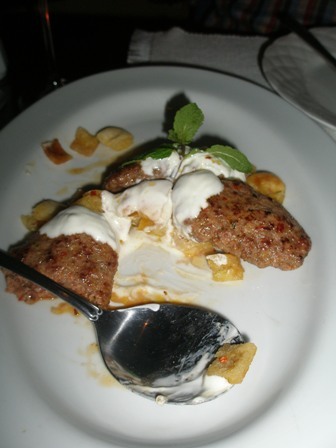 This was part of Nelly’s dish. And Flo had a similarly decorated meat dish. 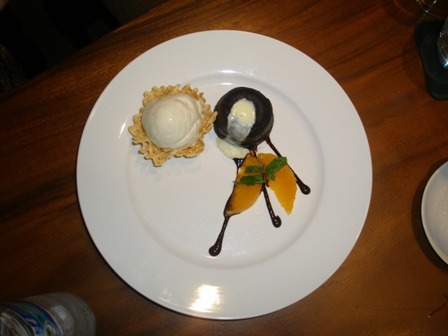 This is one of the desserts we had. 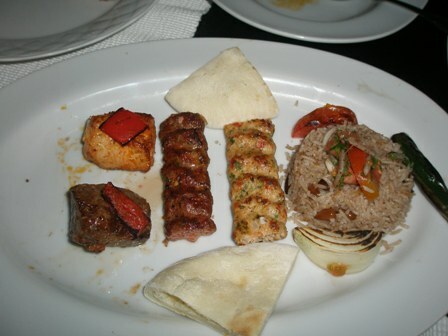 In short, the food was delicious. 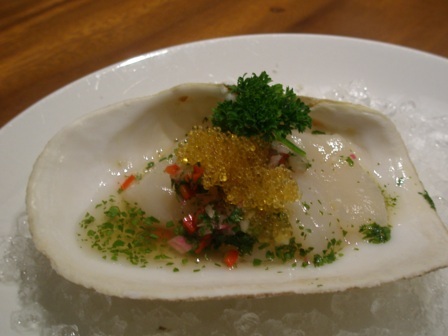 According to some expat Japanese, Gourmet Garage offers the best Japanese food in town. You might like to know what wine we drank. Nothing special, I can tell you. Well, we opted for a simple, red wine from Australia. With ‘Penfolds Rawson’s Retreat Shiraz-Cabernet’ you cannot go wrong if you need a wine for every day which is easy to understand and to drink. Gourmet Garage prices these wines very reasonably. The choice was a compromise, of course, but I did not fancy the whites from the wine list. A Mosel or Saar Riesling would have been my preferred choice. But we had a great time and that was what mattered most. Farewell gifts changed hands (I do not reveal what they were) and at about midnight we parted company as on many other occasions before. See you guys in Bangkok, or on our farm in Glenburn. 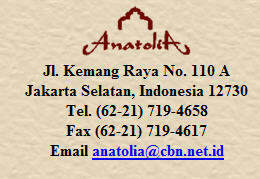 As you know, you are always welcome; ‘sampai jumpah’ as we say in Indonesia. 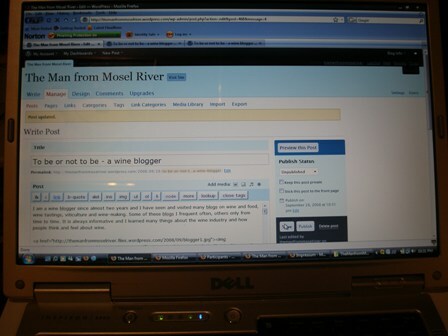 You are currently browsing the The Man from Mosel River blog archives for September, 2008.